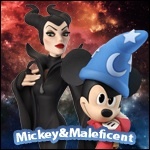 Disney Infinity Fans • View topic - Figurine boxes? Do you keep them after you open them, or do you trash them? The figures and the cards i am keeping....just not sure if i should take up space with already opened boxes?? I throw mine away. To me, there's no reason to keep the boxes unless I leave them in the boxes in the first place (like I do with Light FX figures). I have a hard enough time finding a place to put the figures and the cards, I'd have to get a storage space if I wanted to keep the boxes too. Do the Light FX figures work through the boxes? ^Yes, the Light FX figures work through the the boxes.